The Easter break is now upon us. Schools have broken up for the holidays and you may be thinking of what fun activities you can do this Easter holiday’s that the whole family can get involved in. 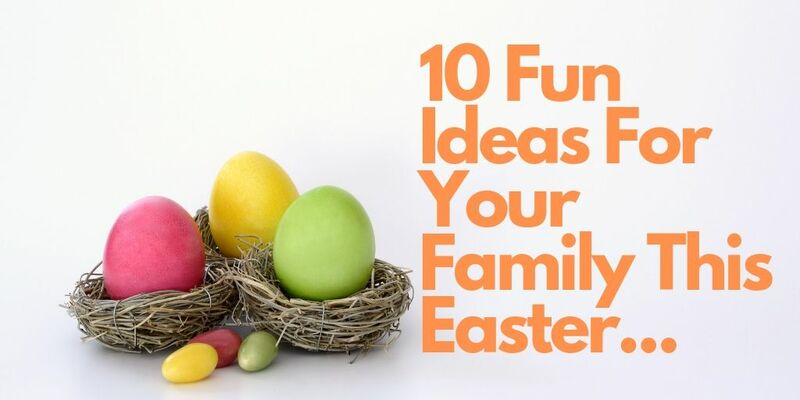 We have come up with 10 fun ideas to keep the whole family occupied this Easter Break! We hope we have given you some inspiration this Easter for activities with the kids, suited to all ages! Creating your own Easter Egg hunt is the perfect opportunity to get the whole family involved! Set out eggs around the garden, or in the park or even in the house! This is something to keep your children and young people occupied for a while. It’s a game that can be played more than once! You could even use mini foil-covered chocolate eggs or plastic eggs if you don’t want them to be having too much chocolate! Hard boil some eggs and let the fun begin! Get out the arts and crafts box and see who can paint the best egg. Use a range of different paint colours, stickers and anything else you can get your hands on. This is something the whole family can join in on! Let the best egg win. The egg and spoon race is a classic school game that has been played for years. Why not set up for own egg and spoon race in your garden or local park. Get your children involved and even ask their friends. The perfect way to spend some time outdoors and a bit of friendly competition. Who knows … there could even be a prize for the winner. Time to put on the apron and start baking in the kitchen! Look up some of your family favourite Easter treats. From some traditional treats such as hot crossed buns, to some creative cookie designs! Having a family picnic is a great way to spend some quality time together. Get together your favourite foods and your child or young person’s favourite snacks. Find the perfect outdoors locations, this could be in their favourite park. Sit back and relax together. Or even when the weather isn’t great, have a living room picnic! You could even put on their much-loved movie! Think of some of the old classic loved board games! They are always guaranteed to put a smile on everyone’s face! Some classic board games; Clue, Monopoly and Snakes and Ladders! Pull out that craft box it’s time to get creative with the art supplies. Have your children make their own puppets and create their own script! Get them to perform their show in front of you and other family members. Get out your glue stick, pens, paints and fuzzy felts. Using a wire wreath or faux wreath place plastic painted eggs and stuffed bunnies onto the wreath. Along with any other EGGcellent crafts you can find. Once finished leave to try before hanging up on the door! A great activity is getting the colouring book out, or even printing off some Easter colouring pages from the internet! You could even hang them around the house for some seasonal décor. Why not pick one of the best Easter movies and sit down as a family and watch them together. You could even get some classic cinema snacks for your day of relaxing. Not sure what are some of the best Easter movies for children? Don’t worry we have done some research on the top 5 must watch Easter movies…. Have an eggs-tra special Easter Break!